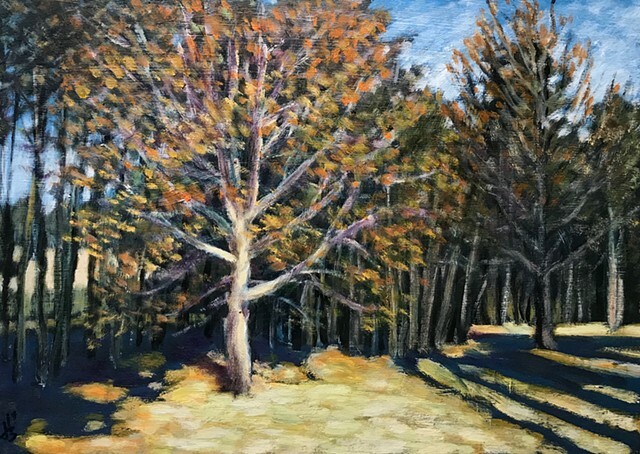 This is a view of the Water Oak outside my studio that I recently reworked. I had originally painted this in 2014 but had it set aside as a sketch to be reconsidered later. It was always somewhere I could see in the studio but it got lost in the shuffle. One day I picked it up and pinned it to my wall and began to paint into it with some things I had just done on another painting. That's how it happens quite often for me, I'll take something I felt I never really got right and with some new clue, skill, or other key, I go back into it and finish it. Time and perseverance are essential in the studio.